Mister Taster made a pizza and says SliceTruck is not spectacular. Tough break SliceTruck, but congratulations Mr. Taster. Mr. Taster (AKA Naughty Adam) is pictured above. The comments in his post do bring up a point that should be cleared up. 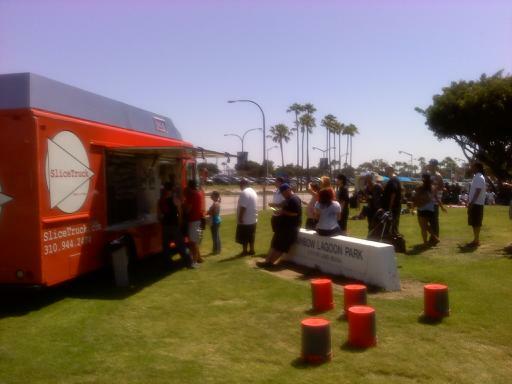 SliceTruck is NOT associated with the Santa Monica pizza place called "The Slice". Officially our business name is "SliceTruck" not "Slice Truck" or "The Slice Truck". Our permanent restaurants will be called "SliceTruck", even if they're buildings and not trucks. If we put a pizza place on a train or in a plane those would also be called "SliceTruck". Please note: If we open a pizza restaurant on a boat, it would be called SliceBoat. I don't get it? Isn't it you guys in the truck?